He was born at Shetford, April 23rd, was “born again” at Bethel Chapel, Radford, 1858. Beloved by all who knew him either officially or personally; recognised as a worthy, “faithful man, who feared God above many;” he was the possessor of a strong, beautiful, rich character. Beneath a somewhat ordinary exterior, beneath the “absence of parade or affectation,” behind a quiet, reserved manner, you sooner or later discovered a man – a man with a soul full of energies and noble aspirations, with a passion to know God, with a willingness to press into Divine service all he was and had, with a keen relish for the spiritual, with a well-spring of love and tenderness within for the sorrowing and suffering, with a molten zeal for the salvation of men, with courage to stand by his convictions. The gold of his nature lay beneath the surface. While we do not claim for him perfection – for who is perfect save God? – more of his type of manliness would greatly enrich the world. Splendid are the testimonies to his nobleness, usefulness, worthiness. One shall be quoted. Rev. G.G. Martindale, writes thus: “In his personality there was great absence of parade and affectation, but a true appreciation of integrity and fidelity to convictions . . . . Both the funeral ceremony – so large that some stranger bystanders thought an eminent and public man had passed away – and the memorial service were eloquent testimonies to his widespread influence. Rev. J.H. Hemshall, who preached his memorial sermon, brought to light a few things of his somewhat quiet and apparently uneventful life. He pointed out the following:- “As a worker for Jesus he was worthy of eulogy. Soon after conversion his name appeared on the Nottingham plan, including Hucknall Torkard, Stapleford, Eakring, and Oxton as a branch. For 43 years he was a preacher in active service, had travelled many miles to announce “glad tidings,” laboured more than acceptably in our own and other denominations, and was often in great demand.” “He was raised up in those days when our Connexion had some of its sternest struggles and stirring successes. Being a lover and student of the Book of Books, a keen observer of human nature and life around him, an appreciative retentive hearer of all good things, he drew from these sources his always good, homely, forceful messages.” But his life, – that was his best sermon – a message divine – which both savoured of “whatsoever things were lovely and of good report,” and added force and weight to whatever he said.” For well-nigh 35 years he was a class leader. It is here that he will be most missed. As one who intensely loved this work, he filled a most important and difficult post with efficiency, constancy, diligence, faithfulness. One striking feature may be noticed here. He began punctually whether many or few were present, and always closed his meetings within the hour. 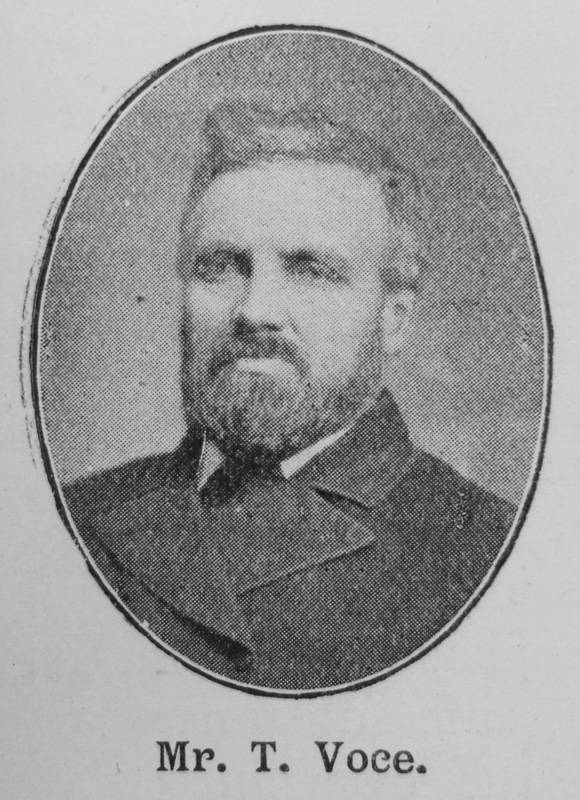 He was a Trustee for both Forest and Hartley Road Churches, took active part in circuit affairs, aided in the development of the Connexion by division, and had lately thrown in his labour and zeal with the Hartley Road and Stapleford branch. In business meetings he freely expressed his honest convictions; in disciplinary affairs he never spared an offender, but exhorted to duty and diligence; and yet withal there beat within a a true and loving heart. As a citizen he lived as one who was a citizen of a greater city, “whose builder and maker is God.” As a workman, his solid character, his firmness, his religious life, impressed greatly his workmates; for they knew him as a Christian gentleman and saw his true worth. His religion was so incorporated with his daily work that it made him honest, punctual, efficient. Thomas was baptised on 7 April 1833 at Shelford (not Shetford), Nottinghamshire. His parents were William, who worked the land, and Mary. Thomas married Mary Ann Wain (1836-1864) in late 1857 in the Nottingham Registration District. Census returns identify two children. Thomas married Sarah Sims (1842-1931) in early 1867 in the Nottingham Registration District. Census returns identify one child. 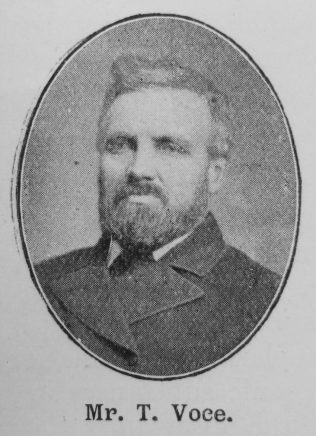 Thomas died in late 1901.